Although you might think brain exercise and exercises for your muscles are completely different, they are not. Mental exercises are necessary for healthy and strong mental functioning just like regular workouts are necessary for muscle development. Brain exercise in combination with natural health remedies can be a boon to brain fitness. Different areas of the brain require different types of exercise: long-term memory, short-term memory, visual-spatial coordination, reaction time and reflexes are example of areas of brain performance can be improved. 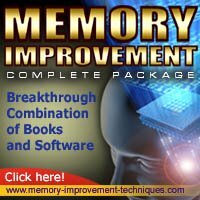 You can exercise your brain through changing how you do normal activities, or you can download special programs to your computer or phone. You can increase your memory. Regardless of which you choose, you can do nothing but benefit from training your cognitive functions more efficiently. Today's technology has made it easy to rely on it to the exclusion of using your natural mental capabilities of pattern recognition, memory storage, and mental math, among others. Try to dispense with gadgets and technology as much as possible in your life. You can write down or memorize phone numbers instead of entering them into your cell phone (enter them later, but attempt to memorize them first). Try using mental math instead of getting out a calculator to figure up change at the cash register. Any chance you have to exercise your brain, take it. According to Harvard Medical School, exercising your brain increases its plasticity, or ability to be shaped (Harvard Medical School, 2006). You can download applications to your phone or use web-based training programs containing brain exercises. One training program is Lumosity. This program offers a variety of games and methods for you to try, and keeps up with your score as compared to your past performances and other people in your demographic. There is a monthly fee, but you can reap benefits from it nonetheless. The program is available either online or as a downloadable. iPhone app: If you want other apps, run a search for "brain teaser apps" online. Another form of brain fitness is a game of chess. You can play an opponent online or against your own computer; Windows Vista and Windows 7 come with a chess application. The different configurations of how pieces move forces you to think several moves ahead in multiple pathways, boosting your brain's ability to analyze patterns and hones your decision-making skills. If you are not a chess person, you can try a game of Sudoku. These number puzzles employ the logical and mathematical part of your brain to ensure all the numbers are aligned correctly. Word games such as Scrabble work well too - and you get a boost in vocabulary while you play.